The Middle East is immersed in its worst crisis in years following the capture of three Israeli soldiers by the Palestinian Islamic Resistance Movement (Hamas) and Lebanese Party of God (Hizbollah) in late June 2006 and early July, Israel's comprehensive offensive throughout the Gaza Strip and Lebanon, and the daily firing of rockets deep into Israel. And horrific as it is, the current toll of death and destruction could reach entirely different proportions should a new threshold be crossed -- a Hizbollah rocket that strikes a chemical plant or a heavily populated area in Tel Aviv or Haifa, an Israeli bombing raid resulting in massive casualties, a major ground offensive, or the expansion of the war to Syria or Iran. A political solution to the twin crises of Lebanon and Palestine must be the international community's urgent priority. Waiting and hoping for military action to achieve its purported goals will have not only devastating humanitarian consequences: it will make it much harder to pick up the political pieces when the guns fall silent. 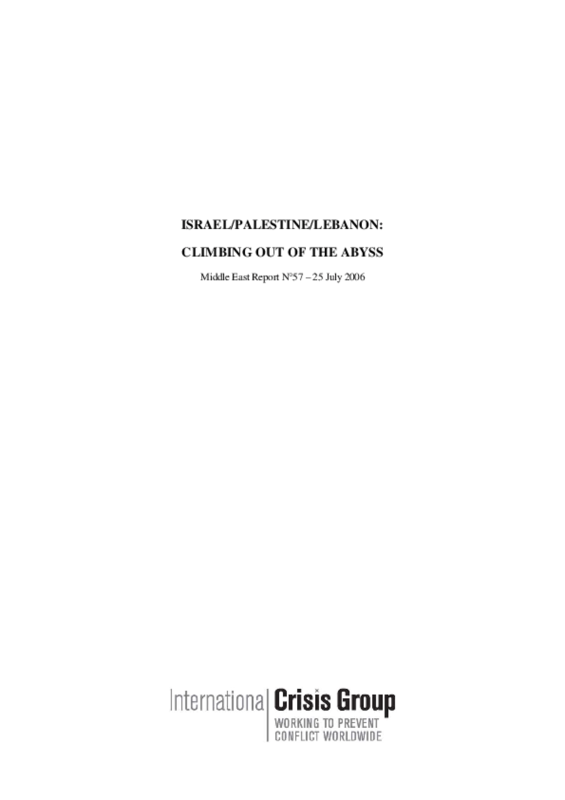 This report is also available in Arabic at http://www.crisisgroup.org/home/index.cfm?id=4282&l=6.